The previous night, David, Alvin, Alli, and I had dinner at Santorini’s fanciest restaurant. By fancy, I mean it was full of gelées and foams. It wasn’t horrible, but it also wasn’t worth the money. Alvin and Alli also complained the hostess who kept coming over to their side of the table had serious B.O. Not very appetizing for any establishment. So after a little snorkeling in Amoudi Bay, I wasn’t expecting much when we came upon Dimitris, a less fancy restaurant overlooking the bay. 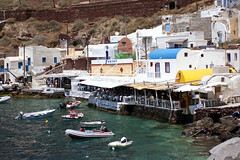 (By the way, snorkeling isn’t great in Amoudi, but we had a nice swim. An invigorating, icy cold swim.) But when the owner took us back to the kitchen to show us the refrigerated case full of fresh seafood and gave us an in depth explanation of all of its occupants, I knew it was a good sign. 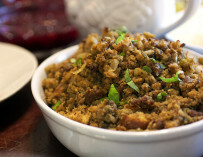 We started off with fava, a regional specialty not made with fava beans but with yellow split peas. 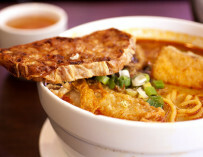 It tastes similar to hummus, but less heavy in texture and taste because it isn’t made with tahini. 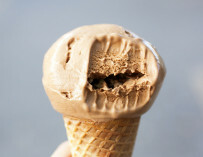 In the hot weather, I appreciated the lighter fare. I also liked the capers on top. 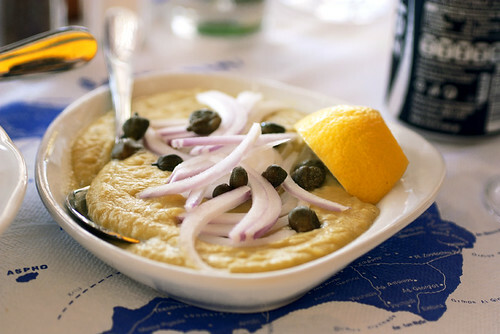 Santorini is known for their capers, and on the island, capers are found in many of the dishes. 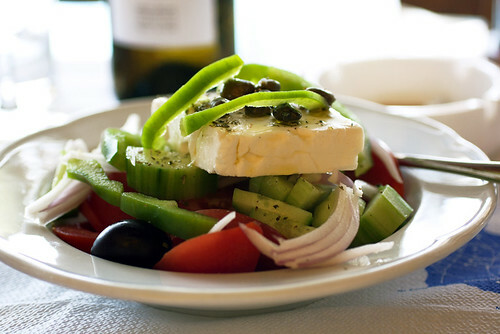 For example, more were found on the Greek salad. Considering we ate Greek salad at practically every meal in Greece, I welcomed the smallest bit of variation. Besides the capers, the tomatoes also made the Greek salad very tasty. Tomatoes in Santorini are extremely sweet. 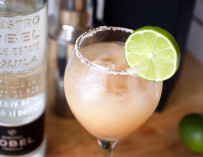 They say it has to do with the volcanic rich soil, and after tasting the tomatoes, I believe it. Their cherry tomatoes are especially amazing. Very sweet without too much acid. 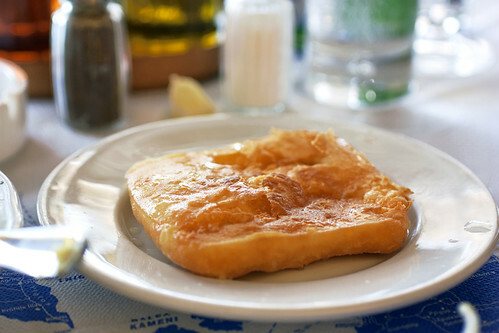 Saganaki, fried sheep’s or goat’s milk cheese, is another local specialty. What can I say? There’s nothing I don’t like about saganaki. It’s salty, fried, and cheesy. What’s not to like? We had saganaki throughout our stay in Santorini, and it was the best at Dimitris. They seemed to do a good job frying it so it had just the right amount of chewiness throughout. 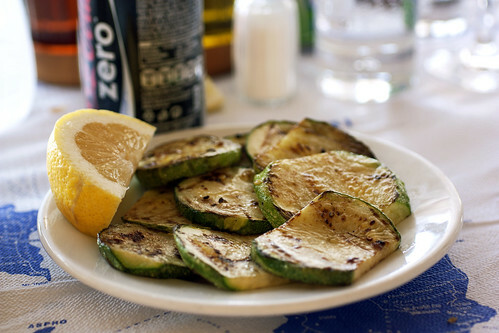 Simple, grilled zucchini was also very good. Again, great local produce. 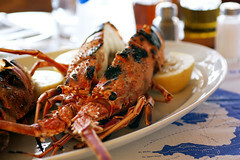 However, nothing compared to the lobsters. We ordered two, one rock lobster and one spiny lobster, both grilled and served with lemon-olive oil dressing on the side. It was my first time having rock lobster and I could see why it was named so. The squat torso shell looked exactly like a rock. As for the meat, it was dense with a very pronounced taste of minerals and the sea. 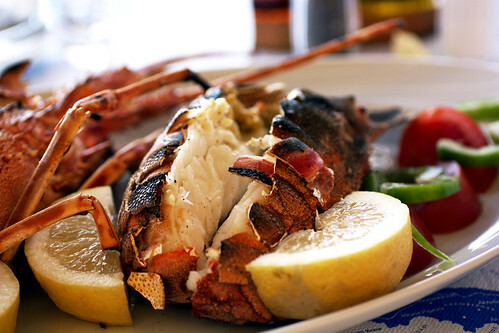 I liked the rock lobster, but I loved the spiny lobster. It wasn’t as meaty as the rock lobster, but the flesh was more delicate and had a lingering sweetness. Dipped in the lemon-olive oil, it was pure magic. While I was pigging out on the lobsters, David did quite a bit of damage himself. 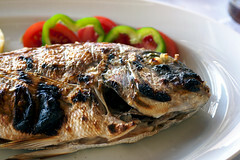 He ordered a beautiful red snapper that was again, simply grilled and served with lemon-olive oil dressing. The lemon in the dressing complemented the rich, meaty flesh nicely. The entire meal for four with a bottle of dry white wine from Sigalas Winery (right behind the restaurant in Oia) and complimentary shots of super sweet vin santo for dessert came to a total of $396.56 (with tip). It was our most expensive meal of the entire trip, but it was my favorite as well. In fact, I casually suggested we go back to Dimitris the following day, but luckily for my wallet, no one took my suggestion too seriously. Leaving Santorini, however, my stomach was full of regret. Next time I’ll make sure it’s full of lobster instead. I’ve been really enjoying your Greek vacation write up. 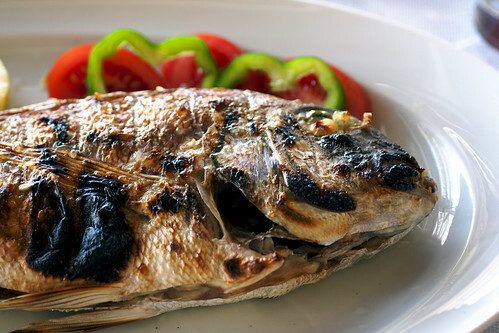 Love the local seafood ones the best!